Can you imagine how this looked? Here are these men who’ve been the authority on worship tradition for years confronted by a young carpenter who just appeared out of nowhere. He didn’t even go to a good school! Worse, they know He’s right. But if they admit it, they lose their power. A similar thing can happen in our churches today. When leadership is focused on maintaining church tradition, there’s a danger of developing a Pharisaical attitude. A certain amount of resistance to change is needed to keep from forsaking sound doctrine, but often church tradition isn’t rooted in the Bible at all and if that’s the case it’s fair-game for reexamination. We can also, as the Pharisees did, error in emphasizing certain doctrines to the neglect of others. 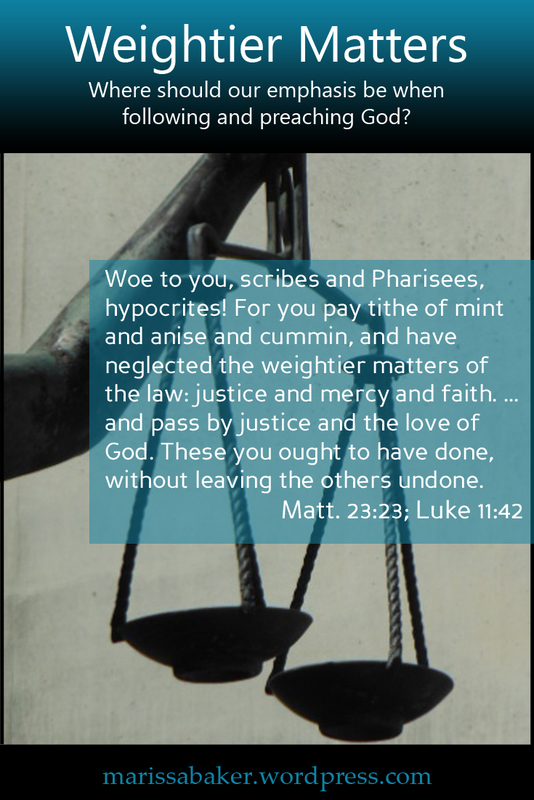 The Pharisees were so concerned with keeping the parts of God’s law that could be seen on a physical level (and more easily controlled in others) that they neglected the law’s weightiest matters. Jesus doesn’t tell them to stop what they were doing but rather to re-prioritize. We have to keep God’s commandments, but unless we have our priorities straight we won’t be keeping them as God intends. If we don’t begin with judgement, mercy, faith, and love then all the other “things” won’t matter. For years when people asked about my faith, I’d sort of mumble and say something like, “Well, I’m a Christian, but we don’t believe in the Trinity, and we keep the 7th day Sabbath and the Leviticus 23 holy days, and clean and unclean meat laws.” The mumbling was because I was shy, but the rest is how I thought we were supposed to talk about ourselves. There wasn’t a nice label like “Catholic” or “Pentecostal” to slap on our brand of Christianity (though I’ve since learned “Messianic” is pretty close), and so we defined ourselves by how we’re different from “them” and by which laws we keep. There’s nothing wrong with going into detail about how you practice your faith, but I’ve come to realize it doesn’t really answer the question “What do you believe?” I’m not saved by keeping the Sabbath and avoiding pork — I’m saved by Jesus Christ. And if we’re trying to share this faith with others, isn’t our relationship with Him the most compelling part of our testimony? That’s how Paul taught. You don’t start out by giving people lists of what they should and shouldn’t do. You start out by introducing them to Jesus. You share who He is, and then that naturally leads to a discussion of the law since it grows out of God’s character traits. We will keep the law if we love Jesus and believe in Him but the weighty, foundational matters of faith and love come first. If we love Jesus, we will keep His words and mimic His actions. We will follow God’s Law and keep the days He made holy, as Jesus did. We will become love, as He is love. We will have faith kept alive by doing good works and bearing much fruit (James 2:14-26; John 15:8-12). Love and faith — things that connect us with God — are not an afterthought. We can’t just tack them on at the end after we do all the other things we’re supposed to do. They’re the reason for how we live. Without them, nothing else we do matters (1 Cor. 13:1-13). God’s righteousness consists in Him being both just and merciful — adhering to His laws and covenants yet also showing grace and mercy toward repentant sinners. Justice and mercy are both part of His core character, and He seeks the same balance in us. This word “justly” — mishpat (H4941) — has to do with acting in accordance with righteous law. It is a key part of God’s character (Is. 30:18) and He “loves judgement” (Ps. 37:28). Mishpat both includes condemning sin (in a judicial sense) and acknowledging righteous conduct. Judgement can be a very good thing. Jesus tells us to “judge righteous judgement” (John 7:24) and discernment is essential in a Christian trying to walk by faith. Yet we’re also warned very strongly against judging others. Why this apparent disconnect? As we examine the warnings we’re given against judgement, it becomes clear that we’re being told to specifically avoid unrighteous judgement. If we’re judging without mercy and love, or hypocritically, then it is unrighteous. This doesn’t mean we can’t call sin a sin or exercise discernment between good and evil. Indeed, we must do those things (Heb. 5:14). These verses are warning against a lack of love and mercy. We’re all sinners and must not condemn others for failing just as we do. It appears from these verses that the way we treat others when we make judgements largely determines how merciful God will be toward us in the final judgement. No wonder, then, that we’re told “if we would judge ourselves, we would not be judged” (1 Cor. 11:31). We must first exercise discernment in our own lives, and then perhaps we’ll reach the point of Christian maturity to judge matters within the church (1 Cor. 6:1-5). 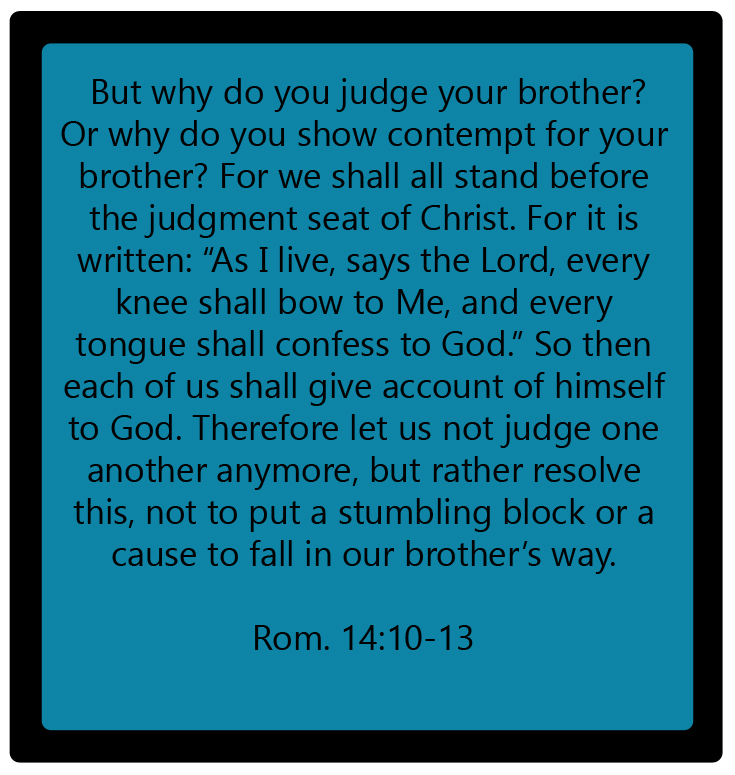 Reading through Romans 14 gives us another facet of this discussion concerning judgement. Here, it appears we’re discussing a matter of one believer understanding less about God’s law and plan than another rather than an actual sin. The more mature believer is warned, quite strongly, that it is God’s responsibility — not yours — to judge His people (Rom. 14:4). Once again, we’re reminded that we’re all sinners who will face judgment and encouraged to help each other rather than condemn (Rom. 14:10-13). 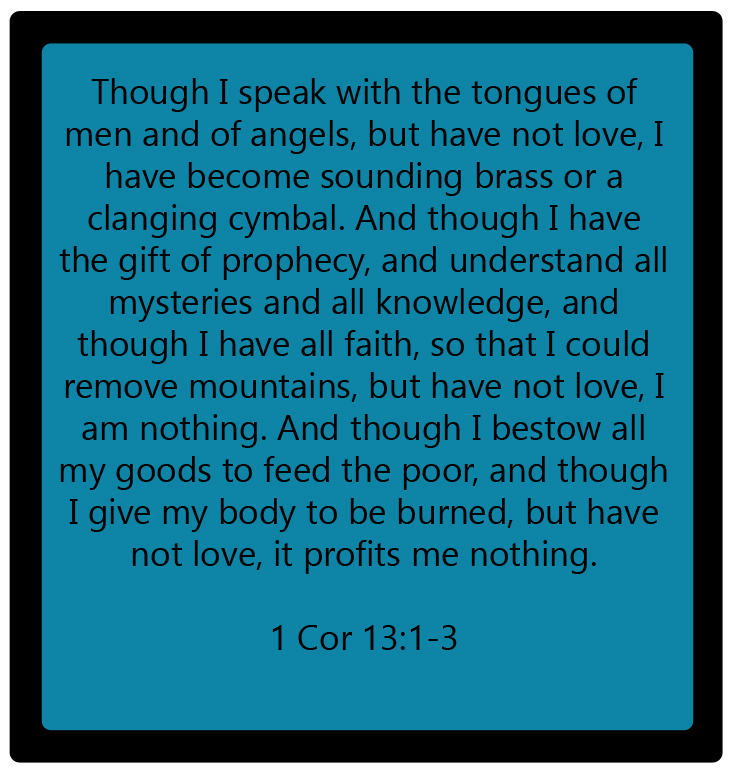 If we’re truly practicing love it seriously hinders our ability to condemn others, for “love covers all sins” (Prov. 10:12). Love never compromises with God’s law, nor looks away while people destroy themselves in sin, yet it also does not violate the law of kindness and mercy when offering correction. It’s harder to act out of faith, love, righteous judgement, and mercy than to only keep the letter of the law on a physical level. True Christianity demands an internal change — a life-long commitment to becoming like God and forsaking ourselves. The weighty matters ground us in our faith and in our relationship with God. Then, if we let Him, God will develop His character traits in us and write His law in our hearts so that keeping them becomes a part of us. I’ve been reading your blog for a while, and I really love it. I am learning so much about Jesus, especially with the book you wrote “God’s Love Story”, thank you for sharing it with others. This has taught me so much. I have read it over and over to truly try and understand, completely grasp what this means. In being hurt pretty badly by “seasoned” Christians recently, this has been very helpful. I haven’t wanted to judge, and yet I read the Tanakh and I wonder why they won’t follow that out when it comes to relationships. I have felt confused, and so I have been seeking the scriptures to understand G.ds heart in this. ….you wrote a book? Where do we get it? I’m sorry you’ve been hurt by other Christians. The church should be a safer place for fellow believers 😦 I’m sure Adonai weeps to see His children treat each other so harshly. Another great blog post Marissa – well worth the read. One of the great keys to spiritual growth is to study – and then SHARE what you have studied with others. Keep studying, and keep writing.